Q: What if my child has never played Lacrosse before? A: Each year we have many new players at all age levels. Some have played organized sports before and some have not. We have recreation level teams for players of all ability and experience. Our experience has shown us that anyone with reasonable hand to eye coordination can pick up lacrosse very quickly and our coaches' approach to teaching encourages learning and insures that everyone receives equal playing opportunities. Q: How are teams decided? A: All teams are evenly balanced. Teams are broken down by the following grades depending on ability and demographic of registration. Kindergarten (6U), 1st-2nd (8U), 3rd-4th (10U), 5th-6th (12U), & 7th-8th (14U). Q: What equipment will I need to buy? A: The basic equipment requirements for girls lacrosse are stick, goggles, mouthpiece and cleats. NOTE: When purchasing a stick, be aware that boys' lacrosse sticks are different from girls' lacrosse sticks. The boys' stick has a deeper pocket while the girls' stick has a shallower pocket. While cleats are not mandatory, they work much better than tennis or running shoes. Many players wear lacrosse specific cleats or soccer cleats. Many players find lacrosse cleats provide additional ankle support. The mouthpiece must be of a color other than white or clear and must not have a strap or tie-string. Q: Can you tell me more about the stick, there are so many options to chose from? A: Choosing a stick for the first time can certainly be a challenging experience - prices range from $30 to $120, there are a variety of colors and they can be subtly different in length, weight and shape. Spend some time researching them on the web. For a first time player, finding a used stick is sometimes the best option. Q: Can you tell me more about the sticks for each age bracket? Developmental (K - 2nd) - There is little need to spend a lot of money on a stick in this age bracket. Color and appeal is the most common reason a player choose a stick while price can be a reason for parents. A starter set (stick, bag and goggle) is a common option for this bracket. Starter sets typically cost $70-80. Some consideration should be given to the weight and shape of a stick. Is the weight appropriate for the player and is the shape comfortable? If a stick is too long for a player it can be cut but remember to take into account a player's growth before cutting. Youth (3rd - 4th) - Players in 3rd and 4th will commonly play with the stick used by developmental players. A stick may have to be replaced if it was cut and the player has outgrown it. 5th grade is a common time for players to move up in stick as they have either grown and need the full length stick or their skills have improved and can benefit from the next level of stick. The 'next level' in stick can easily be purchased for $60-80. 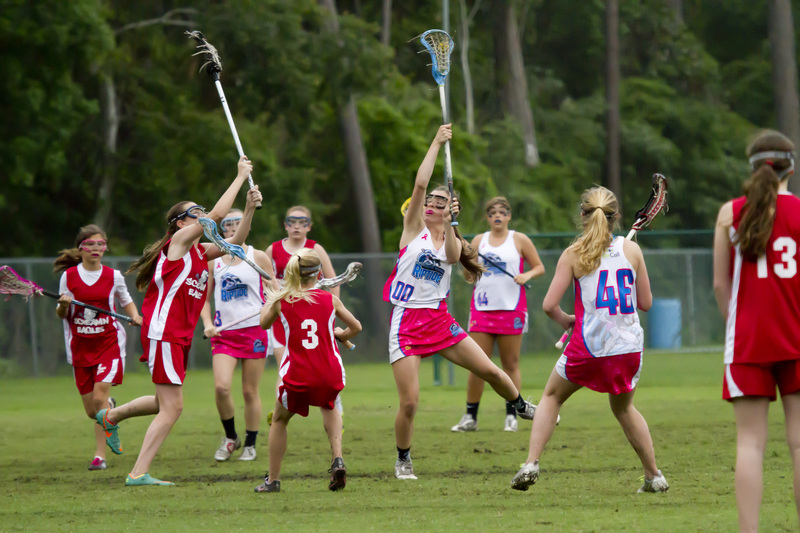 5th - 8th Grade - 5th or 6th grade is when most players move up in stick as they have either outgrown the stick length or can benefit from the next skill level. The weight and shaft diameter are likely to increase from those commonly used in the Developmental and Youth bracket. The strings of sticks in this bracket should be flexible and allow for a pocket to be formed that allows for catching and holding a ball. For 8th graders it is common for them to upgrade to a stick they will use in high school and may be more defined for a position. Older players in this bracket begin to recognize which sticks they like better because they allow them to catch, throw or shoot more easily.